Balboa Island residential and commercial customers can count on Patio Place when they want brand name patio furniture, outdoor umbrellas, barbecues, fire pits, gas logs, river rocks, outdoor grills, bar stools, kegerators, outdoor fridges, and a wide variety of other patio accessories at a great value. Since 1989, our family-owned business has helped thousands of customers throughout Balboa Island and Orange County furnish their outdoor spaces. We are authorized dealers for the industry's top brands, including Ratana, Galtech, Hanamint, Telescope Casual, Sunset West, NorthCape, Sunbrella, and many others. We also provide Balboa Island customers with skilled repairs. Our repair services include refinishing furniture frames, reslinging outdoor furniture, custom-making replacement outdoor cushions and pillows, removing and replacing barbecue parts, converting barbecues from propane to gas (or gas to propane), replacing umbrella ribs, and recovering umbrellas. Additionally, to keep your patio furniture and outdoor kitchen accessories looking new for years to come, we can fabricate custom-fitted protective covers. Whether you're furnishing a patio, poolside, deck, terrace, garden, balcony, veranda, sun deck, porch, or other outdoor area in Balboa Island, we can help. Throughout the years we have gained extensive industry knowledge and have the expertise to provide you with honest, expert recommendations about our entire inventory. We'll take the time to listen to and answer your questions and provide helpful tips to address space planning, design, color matching, budget, and weather concerns. Our goal is for you to always feel fully confident in and happy with your purchase. Patio Place is open seven days a week. Come by our showroom to view our brand name patio furniture, patio umbrellas, fire pits, bbqs, outdoor kitchen accessories and more. We offer some of the best prices in Southern California and provide conveniently delivery to any home or business in the Balboa Island area. We'll even haul away your old patio furniture for you. 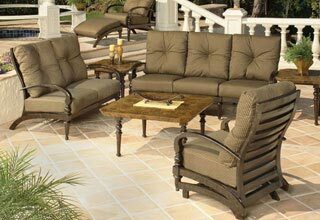 Patio furniture in wicker, extruded aluminum, and cast aluminum styles, as well as bar stools, chaise lounges, loveseats, outdoor sofas, swings, sectionals, cushions, end tables, fire tables, garden tables, and more. Outdoor cooking supplies, including access doors, drawers, fridges, kegerators, lights, range hoods, and warmers. 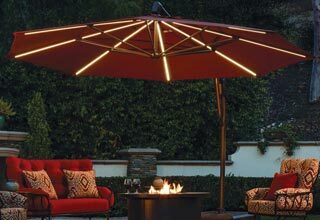 Auto-tilt umbrellas, cantilever umbrellas, custom-made umbrellas, and other patio umbrellas (available in models ranging from 6 feet to 13 feet in diameter). Barbeques and grills. Parts for propane or gas cooking can be ordered upon request. 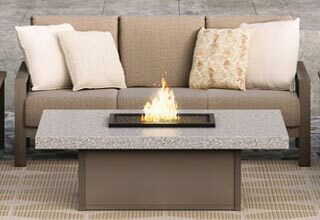 Fire pits and fire tables in varying sizes, heights, shapes, and materials, such as granite, marble, slate, cast aluminium, and more, can be ordered as necessary. For all of the above, we offer the lowest prices in all of Orange County. In fact, with our selection of closeout buys from leading manufacturers, we offer prices that are as low as 50% off of the original price. To learn more, visit us today. Replace and install common barbecue parts, such as doors, hoods, lights, and more. Convert barbeques from propane to gas, or vise versa. 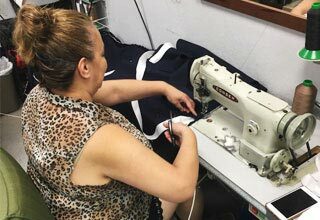 Custom-fabricate replacement outdoor cushions, pillows, deep-seat cushions, settee pads, sofa pads, ottoman pads, chaise pads, round chair pads, square chair pads, and more. Custom-make replacement slings for patio chairs and chaise lounges. Repair outdoor furniture, such as replacing fabrics, caps, bolts, and more. Patio umbrella rib replacement, restringing, and recovering. Thoroughly clean outdoor furniture, which includes washing, vacuuming, and removing bird droppings, bugs, cobwebs, dirt, and dust. At all times, we use only high-quality, long-lasting materials to achieve superior results. We carry over 600 fabric options from Sunbrella, Phifer, and original patio furniture manufacturers, such as Hanamint, Alu-Mont, and others. These fabrics are used to make replacement slings, padded slings, pillows, cushions, and more, and come in such diverse colors and designs that you are sure to find one that complements your decor. Not only are our fabrics stylish and durable, they're also warrantied for years against fading and other exposure damage. To learn more about our repair and cleaning services for Balboa Island residential and commercial clients, call today. We can also silkscreen your business name or logo onto nearly anything, from canvas patio umbrellas to vinyl banners to fabric awnings.